Nicole Shadel (also known as Nicky D Cooks) wears many hats—mom, wife, domestic engineer, cooking instructor and foodie. During the holidays, most kids were outside playing. For Nicole, that was a different story. You could always find her in the kitchen helping her mom. Both of her parents worked full time when she was growing up, so Nicole and her brother had to help out. Eventually, she took over the holiday baking at an early age because her mom was working and her grandmother could no longer do it. The bonus for her family is that she was good at it. She liked to bake and the desserts were good. “Trust me when I tell you that I was never short on people offering to taste the biscotti and other Italian treats once they were done,” she says. To say that her upbringing influenced her ideas about food, cooking and rules in the kitchen, oh it definitely did. To this day, Nicole still cooks with ingredients in odd numbers, says a small prayer when she spills salt and blesses the Easter pies before they go into the oven. Why you ask? It is because what her Nana did. For Nicole, you did not question it—you just did what you were told. Would she trade her childhood for something else? No way, she tells us. She’s very proud of her family and all that she has learned from them. Nicole, who is now living in Peters Township, was gracious enough to respond to some questions we had for her via email. She talked about her cooking class, her cookie business, and some of her favorite Italian traditions. Tell our readers what you do for a living. My life took a turn about a year or so ago. I saw an ad for cooking instructors at the community college. My background is in education… I have an M.Ed in Guidance Counselor Education. I have always worked in this field, and I thought to myself why not apply for the job. I already knew how to teach. I have been cooking and baking since I was 13, so I know how to cook. So I gave it a shot. I applied for the job and I was hired within a week. I have been teaching Italian-America Peasant cooking classes at CCAC for little over a year and a half now. I love teaching these classes, and I really enjoy all of the people who come to my classes. Not long after I was hired as a cooking instructor, I began to blog for the Peters Patch. 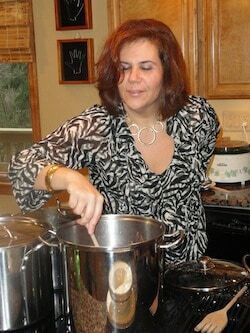 I started to blog about my cooking classes, the food that I cooked and growing up in an Italian-American family. This has been a great opportunity, and I have met some really wonderful foodies as a result. I started to do blogs about foodie friends of mine, and they gladly shared some recipes with me and my readers. It has been so much fun, I love it! Just when I thought that my plate was full enough, I had an opportunity to start my own cookie business. I have been baking since I was a kid. It is funny to say that I have been doing this for over 20 years now. I didn’t think that I was that old. Since I had moved to Pittsburgh, I have been baking Italian Cookies and giving them out for presents at the holidays. I have been approached by several people and asked if they could buy my cookies. After years of people asking me for them, I thought that I would give it a try. Hence my company was born—Nicky D Cooks. I will be making and selling Authentic Handcrafted Italian Biscotti and Pizzelle. Check out my webpage at www.nickydcooks.com for upcoming information and updates. I am baking and selling my pizzelle at Ruggeri’s Food Shoppe in the Squirrel Hill, (http://foodshoppe.com/). For the next few months I will be only making the pizzelle, and then I will see when I will begin to make the biscotti. So where did the moniker Nicky D Cooks come from? I was always called by my proper name Nicole, never a nickname. However my brother Raymond always called me Nic, much to our mother’s chagrin. To this day, some of his friends still call me this. When I choose a penname to use for blogging, I thought that I should go back to my roots. I was always known as Nic so I took that name and combined it with the first letter of my maiden name; hence the name Nicky D. I figured since I would be writing about cooking, my name would explain it all—Nicky D Cooks. What do you enjoy most cooking? To be honest, for me it is a release. Cooking relaxes me. I love being in the kitchen, the sights, the sounds and the smells. I get lost in my thoughts and I just enjoy it. I actually miss cooking if I go for a period of time not doing it. Conversely, it is also a time where I get to spend some quality time with my children. My children will sit on the kitchen stools and check out what I am doing and making. We chat about what is happening in their lives and I love the bonding time we have. I would not trade it for anything. There is a running joke in my kitchen—every day my son will come in from school and ask what I am making for dinner. He will voice his opinion on what I am making for dinner, either a thumbs up or down. Some days he is happy with what I am making for dinner, other days, not so much. My children think that every mom is home cooking dinner nightly and making homemade dishes such as Risotto Milanese, Spaghetti with Meat Sauce with Garlic Bread, Baked Ziti and Meatballs or Chicken Parmesan Sandwiches. What made you decide to become a cooking instructor? At this point in my career, I am taking a hiatus from teaching classes once this semester is over. I have to focus all of my attention on starting up my cookie business. I truly loved teaching cooking classes and I had a wonderful opportunity to meet some really great people. I enjoyed talking with others who share a passion for Italian-American peasant food. I had found many Italians coming to my class to see what I was cooking and how my family made certain dishes. It was great to hear from my students where their families were from and their traditions. Come on now… throw a bunch of Italian together while eating and cooking and it is a guaranteed good time. How long have you lived in Pittsburgh and what do you enjoy most about the city? We moved to Western PA about 11 years ago. We first moved to the eastern part of the city and spent a couple of years living in Forest Hills. My husband and all of his family are from Washington, PA. Several years ago, we moved to the suburbs of the South Hills. We wanted to be closer to family. It has been an adventure for me because I am a total city girl. The first time I saw a deer in my front yard, I screamed. And let’s not talk about the time a turkey was in my driveway and I was too scared to get in my car. Yes, my family laughs at my expense. What can I say other than I am a city gal. I love the simple elegance of the city. My most vivid memory of the city was the first time I came through the Ft. Pitt tunnels—the view of the city coming through the tunnel was absolutely breath taking. I really enjoy seeing the pride that Pittsburghers have. People are very proud to be from this city, and yes black and gold pride is everywhere. I like going to my favorite foodie neighborhood. There is nothing better for me than walking around in the Strip District, grabbing a cappuccino and walking around taking in all of the sights and smells. I also love driving into Oakland—the smells of the different foods emanating from all of the restaurants. I love walking around Bloomfield, Squirrel Hill, Mt Lebanon. I get my city fix when I am in these places. I have a very ethnic Italian look, so most people assume that I am full-blooded Italian but I am only half. My dad is Portuguese, 1st generation. His parents died before I was born, so I have limited knowledge about that side of my family. I was brought up in a typical Italian house, because my mom has such strong family ties to her heritage. So this is why I will only mention my maternal side when it comes to my Italian heritage. My family is all from the Naples region. My Great Grandfather Antonio Lambrese came from Foggia and his married my Great Grandmother Rosilina Cappola who was from Avellino. Tony has a very successful life as a contractor, and did very well for himself and his family. Their daughter Giussipina (my Nana) married my Poppa, Fernando Cardarelli. His mother was Edvigia Pontarelli came from Rocchetta and she married Michele (Michael) Cardarelli and he was from San Donato Valdi Comino. They bought a farm and made their living being farmers. Here is a funny story about being Italian and knowing your heritage. My husband is a quarter Italian on his mother’s side. His Grandmother (Grammy Millie Magnetta), her family is from Foggia—the same village that my Great Grandfather’s family is from. Holidays were always such a big event in our family. The one that I have always loved is The Fest of the 7 Fishes—La Vigilia. There were certain foods that were only made during this holiday, and every year I waited for them. Nana always told us “no one should be alone on the holidays,” so our house was always filled with family and friends on Christmas Eve. As I got older, I helped prepare the fish and made some of the specialty dishes. When I moved to Pittsburgh, I took over this holiday. And Nana’s philosophy still lives on. Our house is filled with family and friends. My husband had a version of this growing up, but totally jumped in with me on this. He has his own specialty dishes he makes. He jokes that he will not share his secret recipes with me. My children get very excited for this holiday as well. The weeks before I am busy baking so that sets the festive mood in the house. A day or so before, we all head down to the Strip to get our fish; we grab some lunch and make a day of it. My children are now old enough to help with the preparation of this meal. So yes, I do have them help cleaning the fish. The house is a buzz with excitement when this happens. Christmas Eve is just a magical time and I just love it. Our dinner is a hybrid of old world and new modern dishes. I still make the baccala salad and soup, and the fried smelts are a must. My husband makes his version of crispelles and will do some baked stuff shrimp. There is always so much food and I love it. Heaven forbid someone leaves the table and they are still hungry. We are surrounded by family and friends—it is really is a magically evening. There is another “tradition” of sorts that we had growing up. This sounds kind of odd, but we always had a dessert in the freezer in case you had unexpected company. You always needed something to have with your coffee. I can remember my mother sending me to the bakery as a kid, going to get a simple pound cake and bringing back home and storing it in the freezer. We all joked that it was a “guest” dessert. This dessert was also on hand if you needed something when you went to a friend’s house and the bakery was closed. You could never go visiting without bringing something. If you did it was an embarrassment. If you had company over, you always set out coffee and asked them if they wanted something to eat. No thank you was not an acceptable answer—we all knew this. If your guest was hungry, you fixed them something to eat. It may be something light like baby pastina soup or a potato and egg sandwich. If they wanted a light snack or something sweet, then you brought out the dessert from the freezer. It is something that is innate to me and something that I have always done once I had my own house. My husband would joke with me and tell me that we no longer had a dessert in the freezer in case company comes over so I better make something. My friends all know that I have a stash of biscotti in my freezer, just in case. They never complain when I bring them out when we have coffee or a glass of wine. My children’s friends all know the drill when they come to the house and I will ask them if they are hungry. This is why I always have biscotti in the freezer and a box of pastina earmarked for company. I have not; it is on my bucket list. I would love to see the villages in Naples where my family is from, someday I will make it. I really want to go on an eating tour of Italy as well as visit Naples. I would love to eat and sample all of the foods from the different regions in Italy. I have thought about this question and I can surmise this in a single phrase; strength through perseverance. I think about my great grandparents coming to America, with little money and resources. They survived and made a good life for themselves and their family. I also watched the bigotry and the struggles that my grandparents faced. They both left school early to get jobs to help out their families. I remember going with my Grandfather (Poppa) to the bank; I was about ten years old. I went with him to make sure he signed his name correctly on the checks and other paperwork because he could not read. I had to make sure that someone would not mislead him or try to take advantage of him. My Grandmother (Nana) was an amazing lady. She was mostly self taught when it came to an education. She made it to the 8th grade so she could read and do basic math. She learned everything she knew by reading about it. Despite their lack of education and the struggles, they endured, they raised their family and made a good life for themselves. I watched my parents struggle, and saw what they went through. I saw the sacrifices that they made so my brother and I could have a better life then they had. I think about all of the struggles that my family faced and realize that I have that survivor blood running through my veins. Life will give you a few knocks—we all have them. For me, these little bumps will never break me. I will be like a prize fighter going the distance. I will look like Rocky Marciano when I am done, but I will never go down. This strength and perseverance only intensified once I became a mom. Not only do you have to be strong for yourself, but you have to be strong for your children. I am no different than my great grandparents, grandparents and parents. I have had nothing handed to me in my life. I have worked for everything I own. I take nothing for granted and I am grateful for everything that I have. If I was not raised in this type of family, I know that I would not be where I am today. I try to lead a simple life but that doesn’t always work out. When I am not working or preparing for class, I am looking to relax with my family. In my down time, I love to read. I am a bibliophile; I am always reading something. My ADD brain keeps me jumping through various genres of literature, so my tastes for what I want to read constantly change. While I am devouring cooking magazines, I will concurrently be reading pieces from my favorite essayists, a work from the classics or rereading one of my favorite books. I enjoy listen to music and playing with our two pugs named Mona and Larry (Lorenzo). I am getting back into opera again. It is something I love to listen to, although I don’t always make it to see it live in the theaters. I am familiar with of the more famous pieces, but I am still learning about it. The opera fascinates me, it always has. I adore Luciano Pavarotti; I could listen to him for hours. Puccini’s La Boheme and Madame Butterfly, Verdi’s Rigoletto and Bizet’s Carmen are among some of my favorites operas. I mostly cook Italian. I know no one is really shocked. I love simple peasant, uncomplicated food. I am a carbohydrate junkie. I adore macaroni; honestly I could eat it every night of the week. I start to get kind of crabby if I go for awhile without eating some kind of macaroni dish. My favorite indulgent dish is my five cheese baked penne. Sometimes I love the simple food with a twist, and this recipe hits the spot. My dear friend, Aunty Karen, in Rhode Island, gave it to me. I have made my own version of this, and honestly it is to die for. This is a great dish to make for a crowd because it is easy to double. I make this for all of my children’s birthday party. People ask if the “party macaroni” will be made because if not, then they are not coming. Got to love family! What advice would you offer to someone who wants to learn how to cook? A piece of advice that I would give to someone who wants to learn about cooking, start simple. Start with a genre of food that you like and learn about it. If you want to learn about simple Italian food for example, read up on it and ask others for recommendation on cookbooks. Read the cookbooks and see if the recipes are easy to make and then try them. Start with simple recipes and work your way to the more complicated ones. If someone wanted to learn about Italian Peasant cooking, I would recommend Maryanne Esposito. Her cookbooks are wonderful, very useful and full of information. Many of the dishes she makes in her cookbooks are not complicated and anyone can make them. The Internet is a wonderful place to use as a reference. There are so many webpages full of recipes that people have made and many times there are step-by-step directions. I follow so many food bloggers and see what they are making and cooking. My favorite blogger is Mark Bittman from the NY Times. He has an incredible way with food and makes complicated cooking techniques look easy. Also watch the cooking shows—watch people cook. I am a visual learner, so this works for me. Watch what the TV chefs are making and how they do it. Go for the chefs that make things that will easily translate to your kitchen. I like to watch a variety of chefs, and I grab new pieces of information all the time. I watch Mario Batali, Giada, Michael Chiarello Alexandra Guarnaschelli, Anne Burrelle and Maryanne Esposito. I get to see how these Italian Chefs blend spices and work with them in the dishes they prepare. By learning about a specific cuisine, you can become familiar with how dishes are cooked and what spices are commonly used. Many people who start out want to learn all different types at once—it can be confusing especially when it comes to using the right spices. For example, I only use the spice cumin when I make a Mexican inspired dish. Spices don’t always translate into different types of cooking. I have to share a funny story about this. When my husband and I were first married, we both shared the cooking duties because we were both working full time jobs. My husband wanted to make a marinara sauce for dinner. He tasted it and thought it needed “a little kick.” He proceeded to throw in a pinch of cumin into the sauce; needless to say I sat there horrified. I yelled out “what are you doing?” The poor guy looked at me like I was crazy. I told him in a loud voice “sauce NEVER has cumin in it.” I honestly could not bring myself to eat it, I felt bad because my husband spent a great deal of time preparing dinner. By adding this spice, it no longer is a marinara sauce it was turned into something completely different. I cannot make a pie crust to save my life! My husband is the pie maker in the family. He makes the best pies. He learned from the best, his mom. My mother- in-law is an incredible baker. Her pie crust is the best- and it is always perfect!! She has tried to teach me how to do this, but I just become frustrated. Trying to make a pie crust is the bane of my existence. People assume if you are a cooking instructor or in the business of baking, then you know how to do everything. Not true! I am always learning how to be a better cook and baker. I am constantly reading about food, thinking about it and learning more about what interests me in this area. I joke with my family that ADD brain comes in handy to help me do this. My mind is constantly filled with thoughts about food—what dishes I want to eat, how specific food is made and what will certain foods taste like. I set up “foodie goals” each year, things that I want to make or eat that I have never tried before. This year I decided to make a traditional Bolognese Sauce, something I have never done before. I failed; it was not what I expected. My family liked it, but I was not happy with the outcome. I hate to eat a disappointing meal. If I am going to make something new, I will research the dish and find out all I can about it. I learn from my mistakes, and I will try it again. I am stubborn like that, and I will not give up until I have a dish that I am happy with..